We have been offering garage door related solutions to our local community for many years. We owe our success to our “Can do” attitude, which has served us very well. Our technicians are highly skilled in numerous repair and replacement services and they can guarantee your satisfaction. If you want to have a perfectly operational garage door then you have to be prepared to handle spring related issues from time to time. Springs are like the muscles of your door system. They have to stretch and be very flexible while remaining strong at the same time. There are basically two types of springs that are used in residential systems, and our technicians always carry replacement parts for both. The Extension spring is used for doors that are lighter in weight. These springs are wound around a rod on the left and right side of the door. 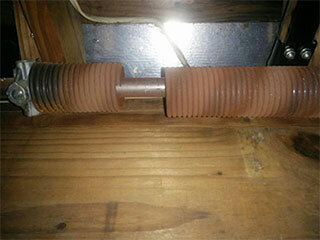 These springs are very hard to install or replace and should always be handled only by professionals technicians. Our team of experts is properly trained to perform the procedures necessary to accomplish this task safely and securely. When it comes to broken spring repair/replacement our staff sets the standard for quality and door spring service. Much like the extension spring, the torsion type is also incredibly dangerous to handle without the proper training. It is usually reserved for heavier doors that are made out of reinforced steel. It is very durable, and will typically last for about 7 years or 10,000 cycles. Each cycle represents one full opening and closing movement of the door. However, some galvanized springs have been known to last for decades. It's important to note that they had undergone routine maintenance throughout their lifetime. Whenever you find yourself experiencing a spring-related malfunction, be sure to contact our experts at Garage Door Repair San Diego to have the issue resolved with speed and efficiency.